Football changed his life. Even before that day in August, everyone said that about Milton Oshay Johnson. in an alternative middle school, a kid who was destined for jail. That’s what some of his teachers told Bobby Johns, the head football coach at Baker County High School. But when Johnson – Milton to his coach, Oshay to family and friends – went out for football before ninth grade, something happened. Not overnight. But something definitely happened. And by the time he showed up for his sophomore season, he was different. Some of the maturation was purely physical. He was stronger, faster, even more ripped. His voice had turned deep. “The man,” his coach says. Even more dramatic than the physical changes were the emotional ones. His grades improved. His referrals stopped. And even though he was only a sophomore, he had become the player everyone looked to for leadership. He wasn’t just going to start at safety. The son of a former Baker County star was going to be one of the best players the community had seen. Oshay turned 16 in July. On Aug. 19, football changed his life again. He doesn’t remember what happened on the field that day. Everyone else who was there can’t forget it – won’t forget it. It was raining. They all remember that part, because that was why they ended up at a church for practice. And normally once they are at the church, even if it stops raining, they stay there. But the previous week, when 20 players came down with a stomach virus, they cut short training camp. And with the season-opening game against West Nassau only days away, the coaches wanted to get in full practices in pads. So when the skies cleared, they went back to the school. They were running a drill that pitted the first-team offense against a squad whose job was to mimic West Nassau’s defense. Johns was getting upset. Oshay was standing next to him, listening to him try to explain to the young players on the scout team what he wanted. Johns didn’t get a chance to respond. The next thing he knew, No. 21, his starting safety, had run into the defense, grabbed one of the other players and told him to go to the sideline. Kendrick Sampson, the backup quarterback, took the snap and dropped back to pass. Not seeing anyone open, he scrambled to his right and took off running down the field. Oshay came flying across the field. They don’t have tape of the hit. But coaches and players have replayed it in their minds countless times since. They say Oshay didn’t lower his head; that, contrary to what some doctors have suggested, it was almost a textbook hit. And a big one. It was the kind of hit that drew hoots and hollers from players. Even when they saw Oshay wasn’t moving, they didn’t panic. They thought he was messing around, playing a joke. The head coach trotted over, thinking maybe it was a shoulder injury. When the coaches got to Oshay, he was having trouble breathing. They thought maybe he had the wind knocked out of him. They unbuckled his belt. And then he stopped breathing. And his eyes rolled back in his head. An assistant coach checked for a pulse. Nothing. The next 23 minutes seemed to move both frantically and in slow motion. Someone called 911. While Johns cradled his player’s neck, two assistant coaches stretched the helmet as wide as they could and slowly eased it off his head. Then Johns began giving mouth-to-mouth, while assistant coaches Scott McDonald and Hildrick Garrison took turns doing chest compressions. Oshay quickly regained consciousness. His eyes returned, staring up at the coaches with a look they’ll never forget. The coach blew a breath into his lungs. “Do you know who I am, Milton?” he said. The breath came back out with a hoarse response. They continued this give-and-take until the ambulance arrived. The coach giving the player a breath, telling him to hang in there, asking him questions, listening to responses – raspy words that those who were there say they will hear for the rest of their lives. “I want my momma,” he kept saying. The ambulance, it turned out, had been on the scene of a car accident. Before the EMTs took over and a helicopter arrived to take the player to Shands Jacksonville, the coach filled his lungs with one more breath. “I love you, Milton,” he said. Using his coach’s breath, the player responded. Will he walk again? That’s usually the first question people ask when they hear about Oshay. With stories like this, everyone wants a happy ending. And by that, they often mean walking. But this isn’t an afterschool TV special. It’s not that simple. 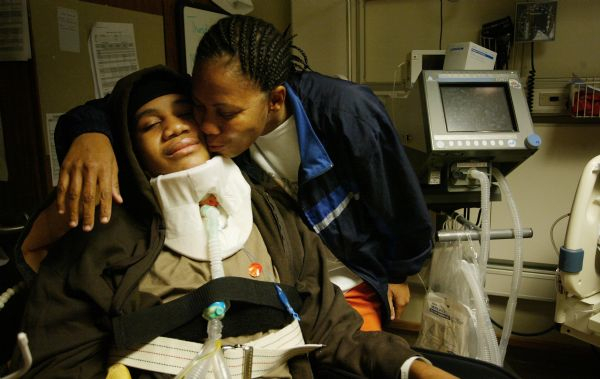 It’s not just that Oshay suffered a spinal cord injury. It was a fracture of the C-3 vertebrae. If you go by bell curves and statistics and doctors’ honest opinions, the consensus is it will take a miracle, or some medical breakthrough, for Oshay to walk again. But in the past four months, he has taken some huge steps. After going a couple of months without being able to speak – communicating only by blinking or mouthing words – his voice came back. “He said, ‘Momma, Momma, I can talk,’ ” said his mother, Adrium Jefferson. You think hearing a baby say his first words is dramatic? Imagine a 16-year-old saying his first words. Imagine what it felt like to breathe again. Not completely on his own, but without a ventilator. 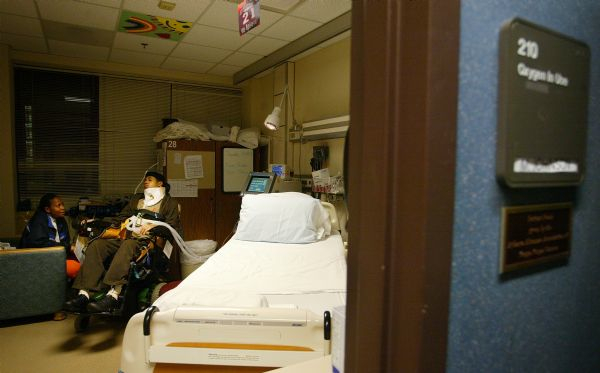 He spent two months at Shands Jacksonville, then went to the Shepherd Center in Atlanta. While there, in addition to rehabilitation, he had surgery to implant a diaphragmatic pacer, basically a pacemaker for breathing. Now he’s back in Florida, at Select Specialty Hospital in Gainesville, learning to wean himself off of the ventilator. The self-described country boy – he likes hunting, pickup trucks and Kenny Chesney – hopes to be home soon, back with his mother and father, Milton Johnson Jr., and two brothers, 18-year-old Christopher and 8-year-old Javari. They live in Sanderson, in a double-wide trailer that now has a ramp leading to the front door and an emergency generator. Those are just small pieces of the community’s response. Not far away, ground will be broken soon for a new home. Money is being raised. Businesses, big and small, are donating materials and labor. “He’s not my child; he’s the community’s child,” his mother says. He’s alive. He’s breathing. That’s her idea of a happy ending. Still, this story is overwhelmingly sad. There’s no way around that. But it also is overwhelmingly sweet and profoundly uplifting. The hit lasted a split second. The force of it continues to be felt. Go back to that day in August and the moment after the EMTs took over. Coach Johns stood up, took a deep breath and looked around. He had been so focused on trying to save one player’s life that he hadn’t been aware of what the rest of his players were doing. They had gathered around the scene. Many of them were on a knee. Most of them were crying. Johns, 38, is a former Baker County player. He became an assistant coach, moved on, then was lured back home three years ago. He took over a program that booster club president Fred Munson says can be described with three words. The stadium has a JumboTron scoreboard. Prime season tickets are hard to come by. Munson has had his seats for more than 20 years. And until recently, he never even had a son on the team. When Johns became coach, the team was coming off an 0-10 season. He turned the Wildcats back into winners. And before this season, he got an offer to leave for a higher-paying job. He isn’t talking so much about being there to administer CPR that day – but about being there for what has happened since. They canceled practice the day after the injury. And the coaches weren’t sure what would happen when they returned to the field. All of the players were struggling, but especially the sophomore quarterback who had collided with Oshay. “I thought it was my fault at first,” Sampson said. The coaches, of course, told him it wasn’t his fault. He didn’t make the hit. He got hit. It was a freak accident. It could have involved anyone. But it didn’t. It involved him. And when the Wildcats returned to the field, Sampson didn’t want to go hard. “I didn’t want anyone else to get hurt,” he said months later. The coaches worried that Reuben Jackson, the starting fullback, would never play again. He had become best friends with Oshay, doing every workout with him. But all the players are close, Johns said. Race and background don’t matter. They’re like brothers, especially the ones from Sanderson. And in the past four months, those kids did a lot more growing up. When Oshay was at Shands, unless they had a game,someone was at the hospital. Several nights a week it was the head coach. On Saturdays, he brought a treat. Game film. Johns says that one of the players who visited most often was Sampson. He is quiet by nature. But in this situation, with Oshay unable to talk, he had to carry the conversation. In mid-October, Oshay was moved to the Shepherd Center, a renowned catastrophic care hospital in Atlanta. It’s where J.T. Townsend, an Episcopal High School football player who suffered a spinal cord injury in 2004, went for rehabilitation. And it’s where Oshay made some of his most dramatic improvements. As part of a state weightlifting championship team at Baker County, he could bench press more than 300 pounds. At the Shepherd Center, he spent hours and hours in its equivalent of a weight room, a rehab gym where he worked on tougher feats – like using a 1-ounce stick, held between his lips, to turn a page in a book. “When we got here, I told him, ‘We’re on the road to recovery,’ ” his mother said one day while watching a therapist stretching his leg. Much of that recovery can be traced to doctors, therapists and cutting-edge equipment at the Shepherd Center. Some of it can be traced to Jacob Brooks. As Oshay was doing therapy, he kept looking around the room. There were other patients there. But it wasn’t until one in particular wheeled in that he reacted with a smile. “That’s my best friend,” he said, looking over at a teenager with long hair and a headband. They both grinned, then with only a little prompting began telling about their friendship. Jacob, an 18-year-old from Millington, Mich., arrived at the Shepherd Center a few days before Oshay. Both were dealing not only with the overwhelming physical difficulties, but with depression. “I couldn’t talk and I never wanted to eat,” Oshay said. Jacob helped him learn how to do both. It all started when Jacob stopped by his room one day. He didn’t just offer Oshay some food, he convinced him he could eat it safely. “Best chips in the world,” Jacob said. In many ways, they are an unlikely pair. But it doesn’t matter that they come from different backgrounds, different races, different parts of the country and different circumstances – one got injured on a football field, the other from a fall while using drugs. What matters is that they’re going through the same thing. What matters is that you watch the two together and are struck by – whatever they did in their past – the goodness and strength in both of them now. “I don’t know where I’d be without him,” Oshay said. It’s Friday afternoon, several hours before Baker County plays St. Augustine in the playoffs. In Atlanta, another football game is set to begin. It’s in the Shepherd Center basketball gym, a place ringed with banners for the Shepherd Stealers (basketball), the Shepherd Swords (fencing), the Shepherd Stringers (bass fishing), the Shepherd Smash (rugby), and on and on. Oshay and Jacob are on the same team, the red team. A counselor gives the rules of the game, saying it’s like regular football with first downs and touchdowns. If you have no use of your arms, she says, the ball has to hit you in the front for it to be a catch. Tackles are made by touching chairs with chairs. On one of the first plays, a counselor in a wheelchair drops back and throws a pass that hits Jacob in the chest. As the ball bounces away, the two friends look at each other and break into huge grins. Moments later, by blowing into a mouthstick, Oshay guides his wheelchair across the goal line. He is asked if he wants to come out. No, he says. And then, a few minutes later, he scores again, this time wheeling half the length of the court backwards, drawing a gasp from his mom. “I thought he was going to fall backwards,” she says. After this score, he says he wants to stop. He asks to be taken outside. It is a cold, but sunny afternoon. He sits facing the sun, staring into the distance. He is too tired to talk. So it’s hard to know what this experience – playing football in a wheelchair – is like for him. “Did you enjoy that?” he is asked. A few hours later, he is on the phone, talking to teammates back in Florida. The Baker County Wildcats did play hard again. Unbelievably hard. And it wasn’t because they put what happened in August out of their minds. No. 21 was with them at every game. Before the season began, some described this as a “rebuilding year.” That phrase will never again be the same in Baker County. The Wildcats lost 20-0 at St. Augustine, finishing with a 9-2 record. Even under normal circumstances, it would have been a good season. But under these circumstances, it was extraordinary. Funny thing about that phone call before the St. Augustine game. In this case, the coach can’t remember the words that came out of a speaker phone in the locker room. He just remembers what it felt like to hear the voice, to see he his players listening to it. “I was pretty emotional,” Johns says. For the past four months, a lot of people also have been pretty emotional. Not just Oshay’s family. There are all the opposing teams, starting with West Nassau in that opener, who donated gate receipts. There are the people like Munson and others who are committing resources to help build a modest, yet handicapped-accessible home. There is Melissa Raulerson, a nurse who works with Oshay’s mother at Northeast Florida State Hospital and, beyond helping to organize a big fundraiser back in September, talks to Oshay’s mother every day. One month, Raulerson’s cell phone bill neared $500. Now, she says with a laugh, both women have unlimited minutes. There is an 18-year-old from Michigan whom Oshay now calls a best friend, and vice versa. And there are players and coaches who were there that day. Especially the one who kept blowing air into Oshay’s lungs, asking him questions and listening to the response. For the past four months, every time he has left Oshay’s room, he has said the same last words as on the field that day. These people say the hit might have lasted a split second, but its impact is still felt. They say it changed more than Oshay’s life. It changed theirs.